Native to the Mediterranean region, Western Europe and Ireland, it is difficult to miss these pretty fruit trees as you wander around the south of France. A tough, easily grown and trouble-free plant, the arbousier is surprisingly tolerant of strong winds, making it a great success in this region! From a distance, the colourful fruits (les arbouses) look a little like strawberries, hence the common name Strawberry Tree. However, the taste is most certainly nothing like the strawberry, and has been described as “sweet but insipid”. Interestingly, its Latin name – ’unedo’ meaning “I eat (only) one”- suggests that the fruit is not tasty and one would not wish to eat more than one. 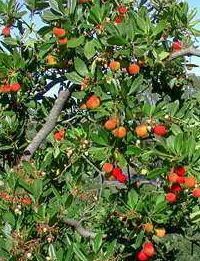 The strawberry tree produces masses of beautiful white flowers in November and December after which the fruits start to fall off the trees. If you wish to pick them before they fall, you should wait until they are deep red in colour and very soft to the touch. They need to be eaten within 24 hours as they start to decay very quickly. Persimmons came originally from North-west China and were introduced into Europe in the mid-19th century. The fruits are very sweet with a soft and occasionally fibrous texture. They have a high tannin content, making them fairly bitter until the fruit matures and the tannin levels are reduced. The colour of the fruit varies from light yellow-orange to dark orange-red and can weigh more than a pound!. There are many varieties of persimmon, which can be split up into two categories – astringent and non-astringent. 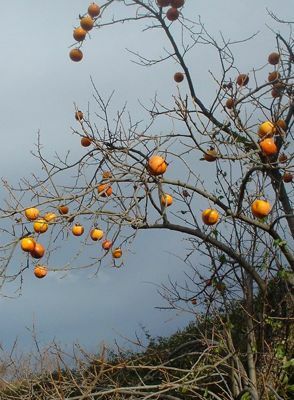 The persimmons which grow in the P-O are non astringent, requiring hot summers, and may be eaten whilst still crisp, although the sweetness improves with maturity. An unripe fruit can be ripened by placing it with other ripening fruits. Persimmon pulp and peel are both good sources of fibre.. Rich in anti-oxidant vitamin C, which our bodies need to help protect against cell damage and to increase absorption of iron, they also contain a good amount of beta carotene, another anti-oxidant, which is converted into vitamin A in the body, which helps us to maintain healthy skin and mucous membranes, to strengthen immunity, and is necessary for good vision. ♣ Cut up lemons and soak in vinegar overnight. 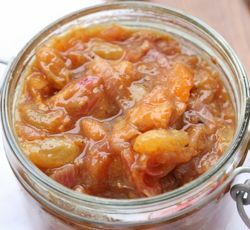 ♣Blanch persimmons in boiling water for 5 minutes, then peel and dice. ♣ Add the lemons with all other ingredients and bring to boil. ♣Continue boiling for about 40 minutes or until the mixture starts to thicken. Allow mixture to cool, bottle and seal.